is Levitt's first community at the Jersey Shore. Selected for the site is Dover Township, at the cultural center of which is the historic Colonial seaport, the Village of Toms River. Rich in history and old-time charm, Dover Township has lured both year-round residents and seasonal weekend regulars that travel the Garden State Parkway "down the Shore." T O M S R I V E R , N . J . Location: Toms River in Dover Township*, Ocean County, N.J.
* On November 7, 2006, residents voted elected to change the name of their township from Dover to Toms River, effective November 14, 2006, adopting the name of the historic settlement that is the Township's downtown business district. See more on the name change under the Community News section at the Gerogetown Today page. Constructed by Levitt and Sons, Inc. as Levitt Residential Communities. Official web site for the Township of Toms River. Dover Township (now Toms River Township) serves as the County Seat. The original Ocean County Courthouse, built in 1850, is located in the Village of Toms River--Dover Township's Downtown named for the river flowing from Barnegat Bay. View the Front Cover and Back Cover of the brochure. 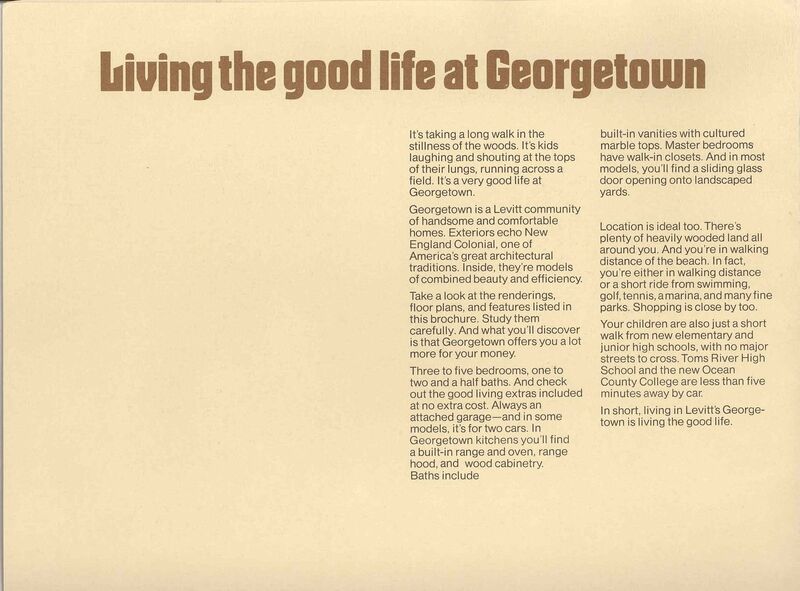 View the Community Profile for "Living the Good Life" at Georgetown. 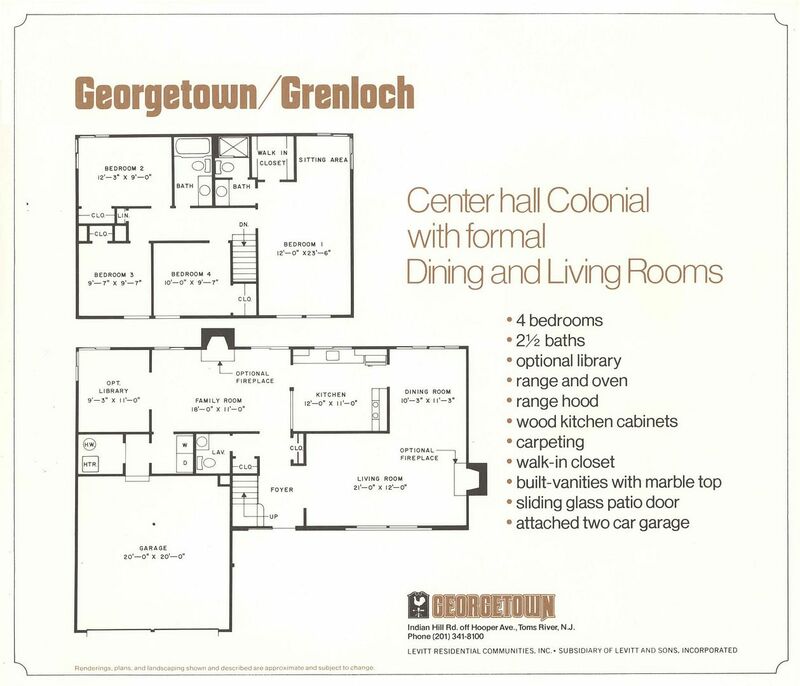 View the Price List and Standard Features for your new home here at Georgetown. 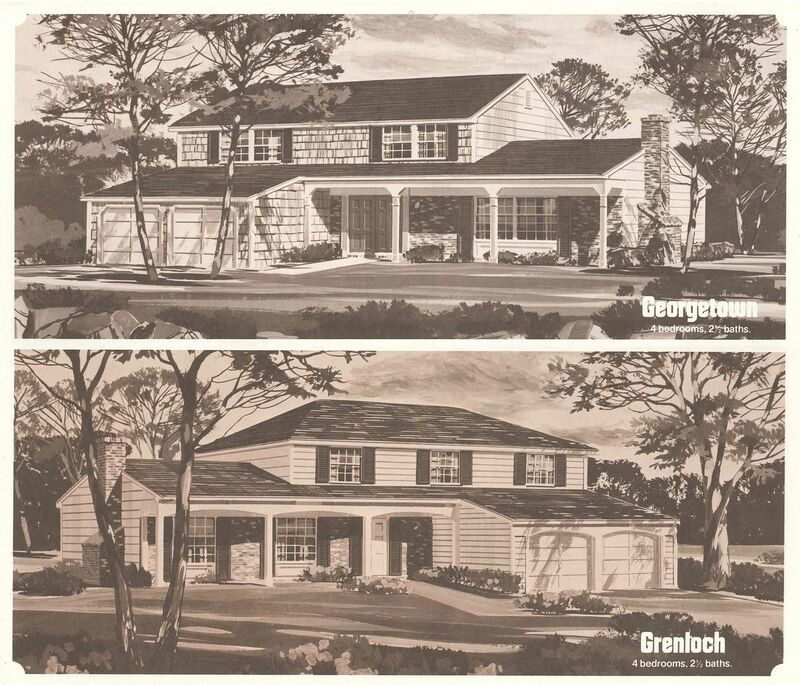 Note that the Grenloch model was misspelled on the listing. 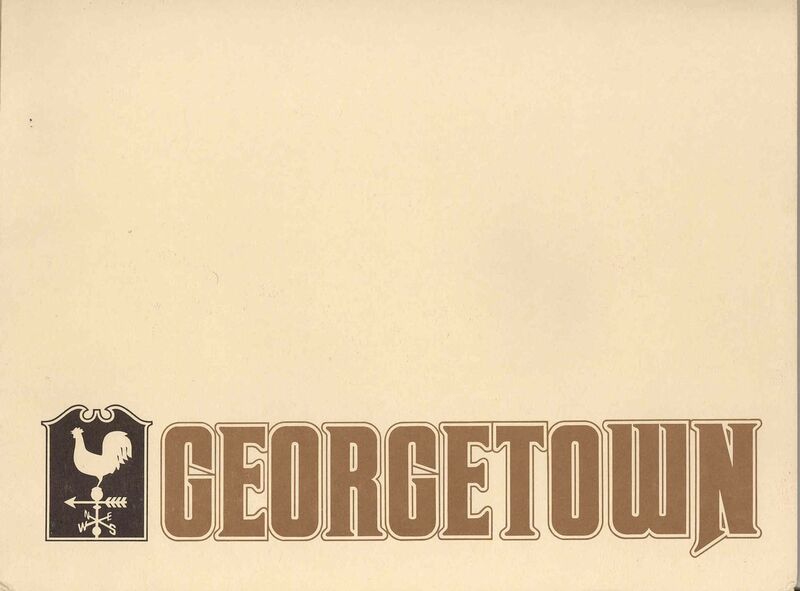 View the list of Options that you may select for your new home here at Georgetown. 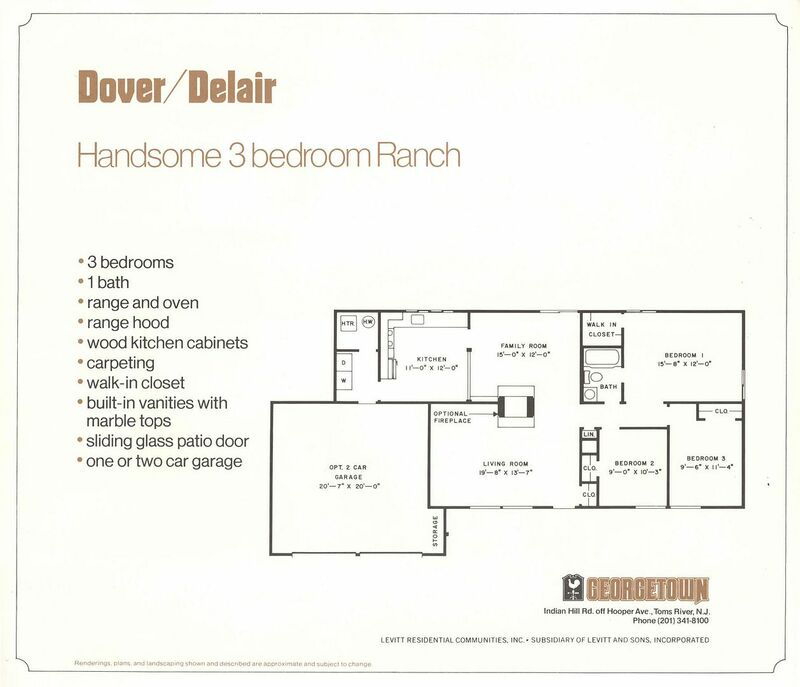 View the Community Plan and reserve your homesite in Georgetown. View the Location Map for the Central Ocean County. Georgetown is here waiting for you at the Jersey Shore on Barnegat Bay. 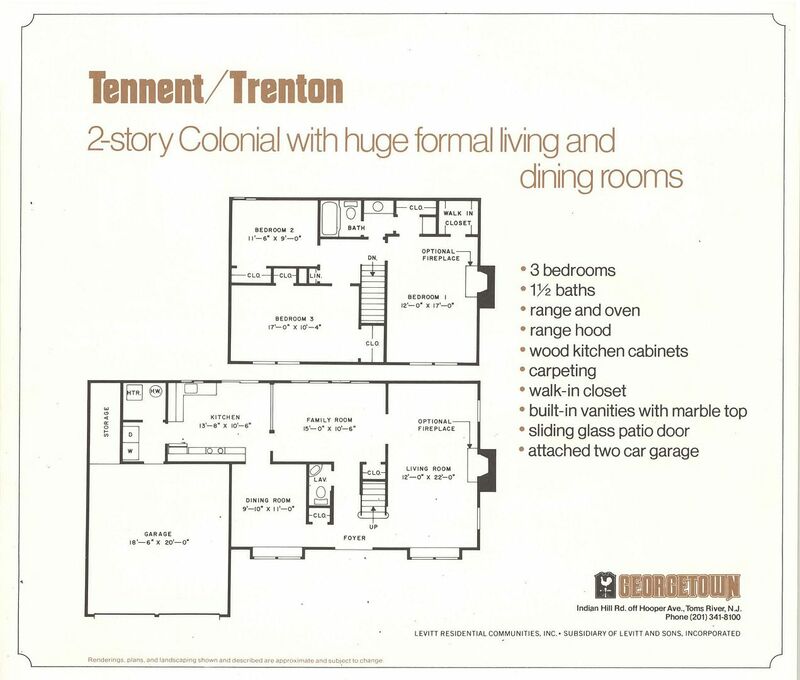 Tour all ten sample homes and select the style of your new home in Georgetown. 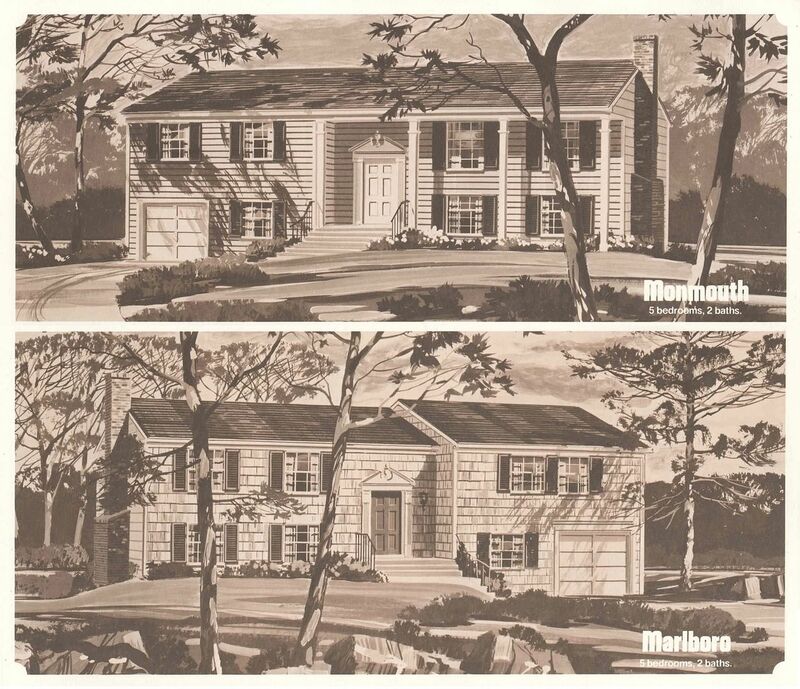 Five Traditional plans each in two exteriors are available. Each home was created exclusively for Georgetown with added flexibility to suit any need or lifestyle at this charming Shore community. 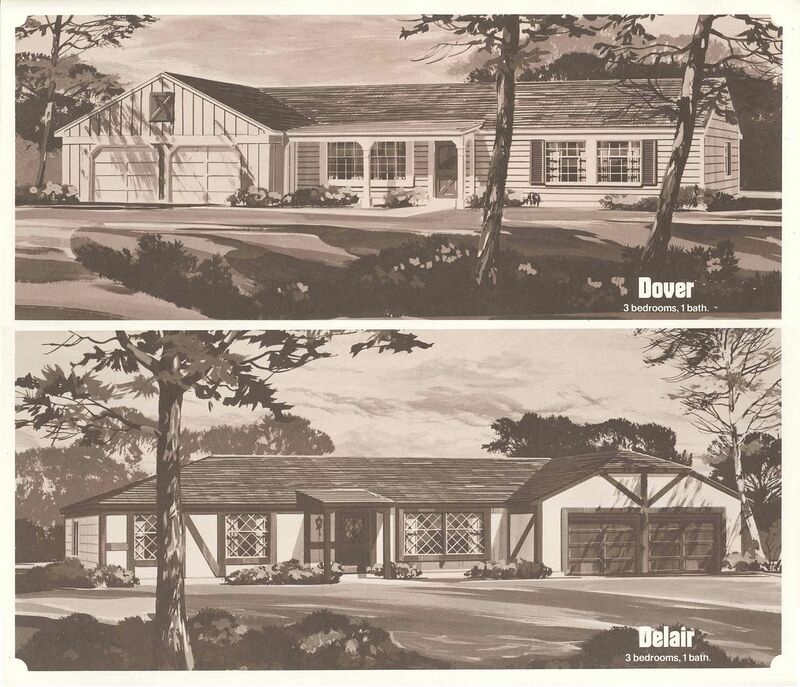 The homes are truly New Jersey--each is named for a community in the Garden State. Rancher. 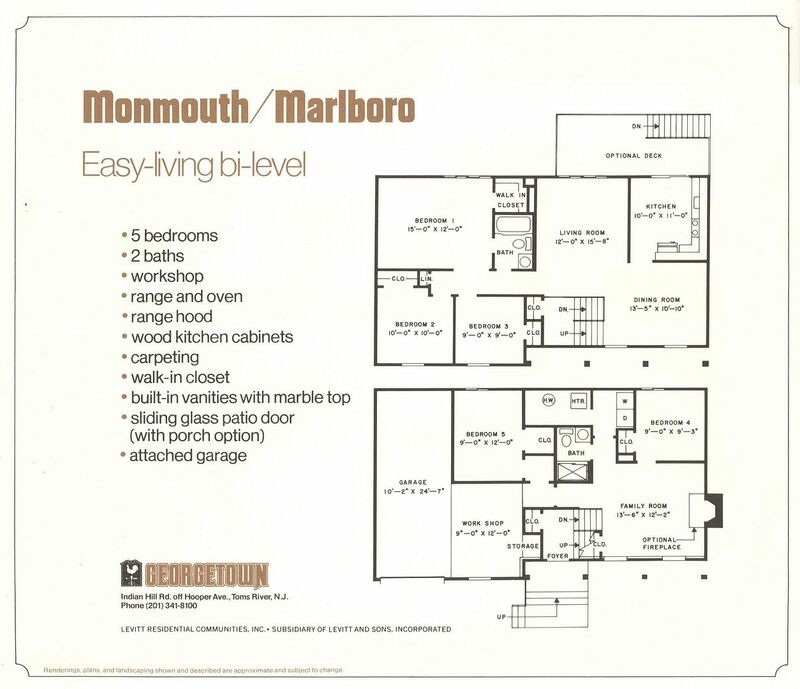 3 Bedrooms, 1 Bath, Living Room with optional Dual Fireplace open to Family Room, Family Room with Sliders to back lawn, Eat-in Kitchen open to Family Room, separate Laundry and Utility Rooms, Master Bedroom with Walk-in Closet, Oversized 1-car Garage with Storage Area, 2-car Garage optional. Rancher. 4 Bedrooms, 2 Baths, Living Room with optional Dual Fireplace open to Family Room, Dining Room open to Living and Family Rooms, Eat-in Kitchen open to Family Room, Family Room with Sliders to back lawn, Large Guest Closet, Master Bedroom with Walk-in Closet, Laundry Room, 1-car Garage with Utility Area, 2-car Garage with Storage Area optional. Bi-level. 5 Bedrooms, 2 Baths, Entry Foyer with Guest Closet, Rear Living Room, Formal Dining Room, Eat-in Kitchen, Master Bedroom with Walk-in Closet, Optional Deck with Sliders from Kitchen and Stairs to back lawn, Lower Level Family Room with optional Fireplace, Bedroom 5 with Walk-in Closet, Laundry Room, Utility Room, Oversized 1-car Garage with Work Shop and Storage Area. Center-hall Colonial. 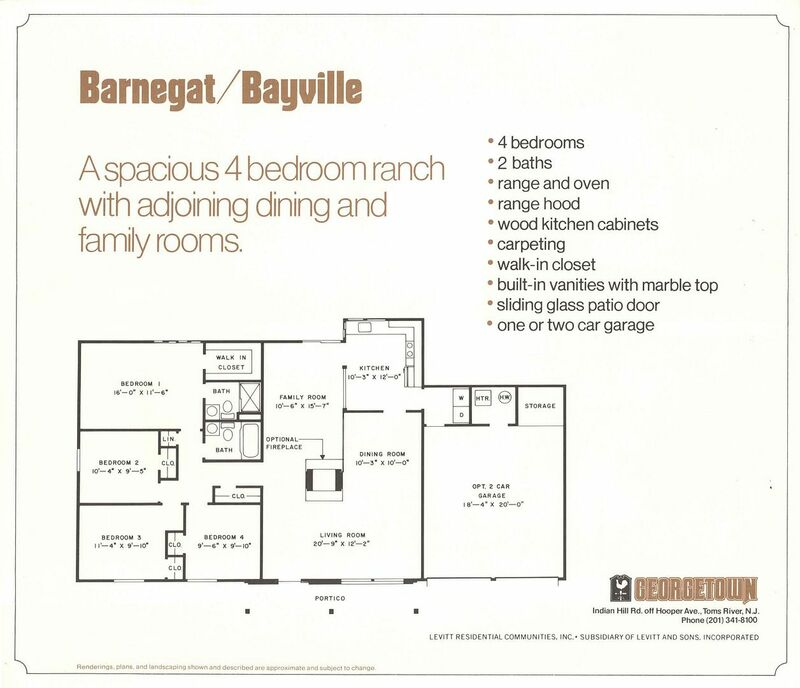 3 Bedrooms, 1-1/2 Baths, Entry Foyer with Lavatory and Guest Closet, Front-to-rear Living Room with Box Window and optional Fireplace, Formal Dining Room with Box Window, Eat-in Kitchen with Sliders to back lawn, Family Room, Large Upper Hall, Master Bedroom with Walk-in Closet, Dressing Area, and optional Fireplace, Main Bath accessible from hall or Master Bedroom, Laundry Room, Utility Room, 2-car Garage with Storage Area. Center-hall Colonial. 4 Bedrooms, 2-1/2 Baths, Entry Foyer with Lavatory and Guest and Storage Closets, Living Room with optional Fireplace, Formal Dining Room, Eat-in Kitchen, Family Room with Sliders to back lawn and optional Fireplace, Optional Library with corner window off Family Room, Master Bedroom Suite with Walk-in Closet and Sitting Area with corner window, Laundry Room, Utility Room, 2-car Garage. The homes in Georgetown were unique to Levitt and Sons. 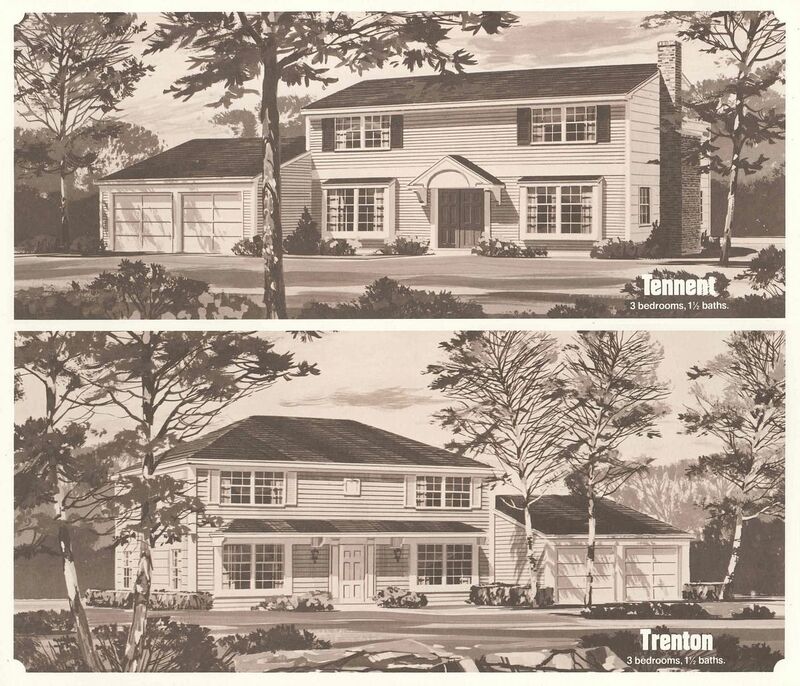 A similar style to the Tennent/ Trenton model can be found as the Williamsburg model in Strathmore East at Coram, N.Y., with some modificaitons. 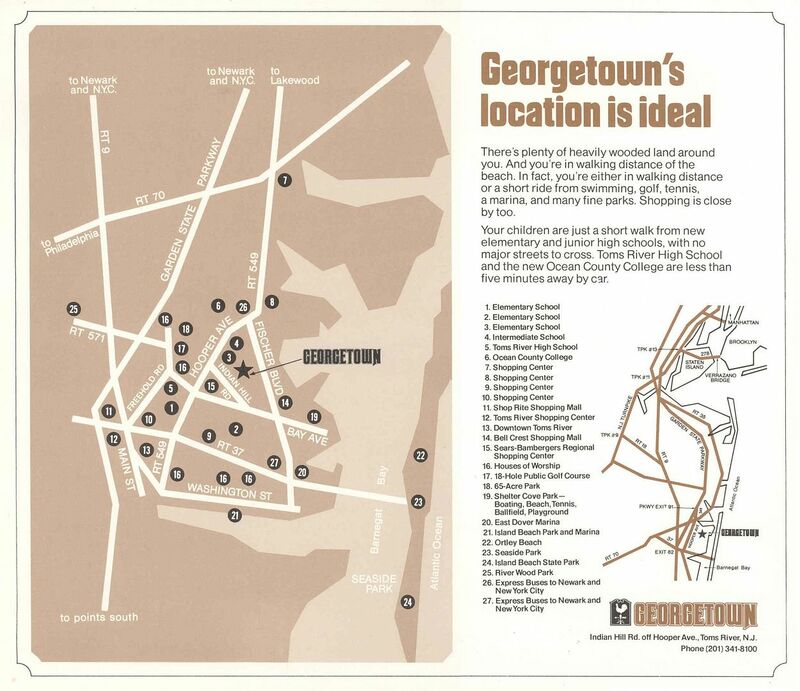 But otherwise, the homes are specific to Georgetown. 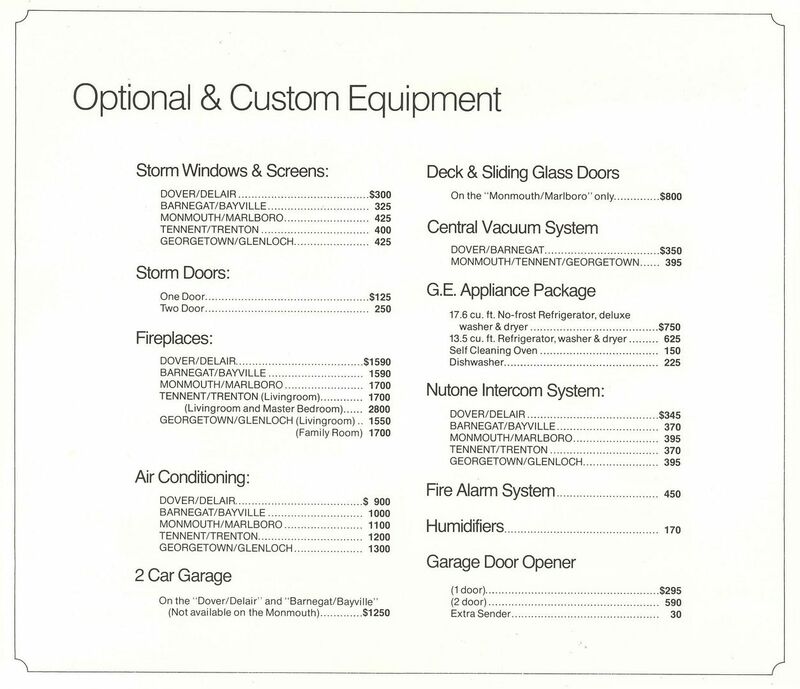 Note that the Grenloch model is misspelled as "Glenloch" on the Price List and Options List (front and back of same page). How do we know which is correct? The models are named for New Jersey communities and there is a Grenloch on the Camden-Gloucester County border, but no Glenloch that could be found in New Jersey. 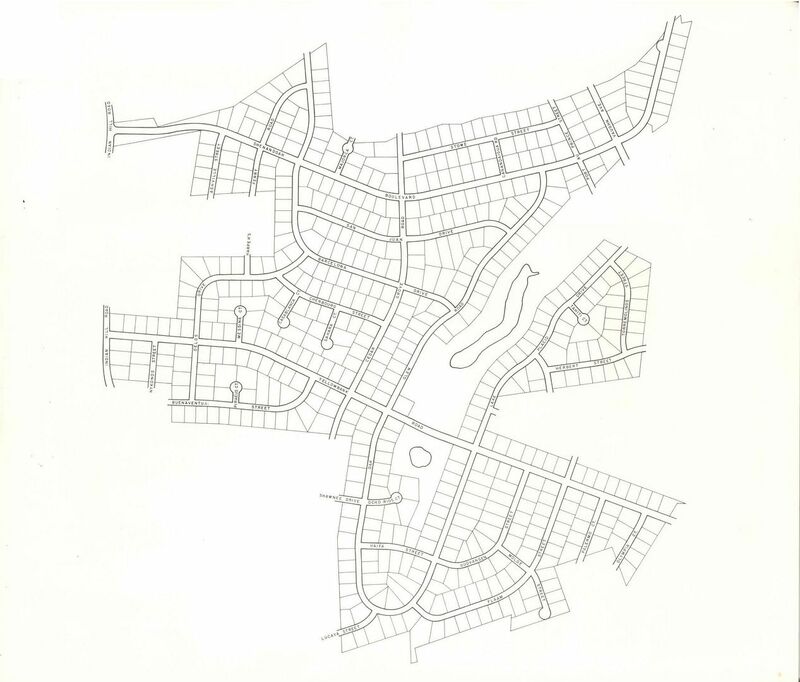 Although the original plans called for an extensive community, only less than half of the planned community was built by Levitt and Sons. 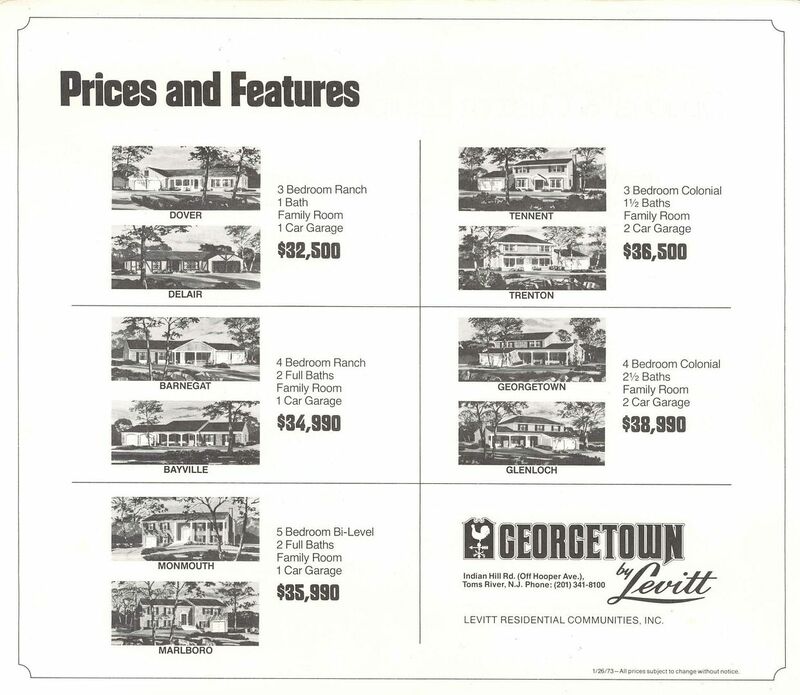 Other builders eventually completed the remainder of the community over the two decades following Georgetown, including K. Hovnanian, Continental Properties, and Kaufman and Broad. Levitt's original street layout was more or less retained, though some modifications were made to create additional open space. View the Community Plan showing the full Levitt plan compared with the actual areas constructed by Levitt at the Georgetown Today page. 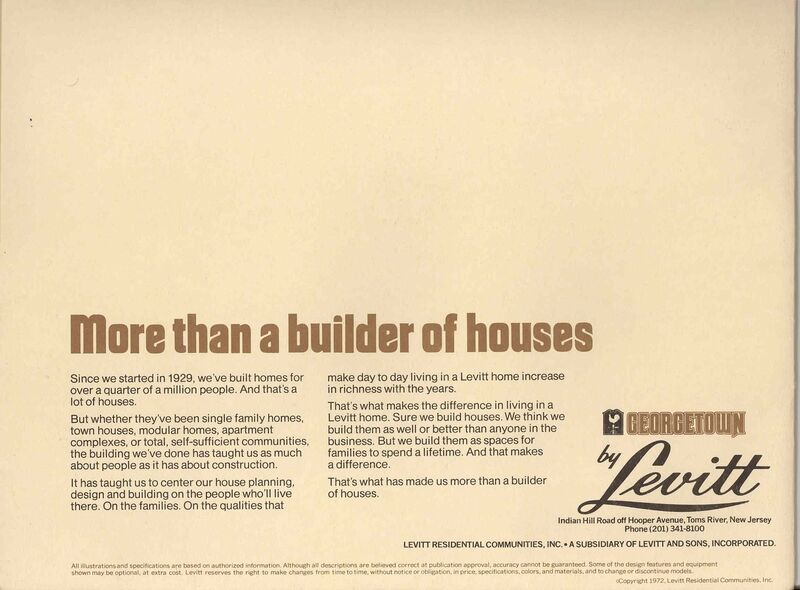 Levitt broke into an area in which another local builder--Hovnanian Bros.--got its start in 1959, and had a strong influence on the Ocean and Monmouth County housing market for many years. Interestingly enough, the Hovnanian brothers first visited Levittown, N.J. in 1958, touring the new construction with Bill Levitt himself. 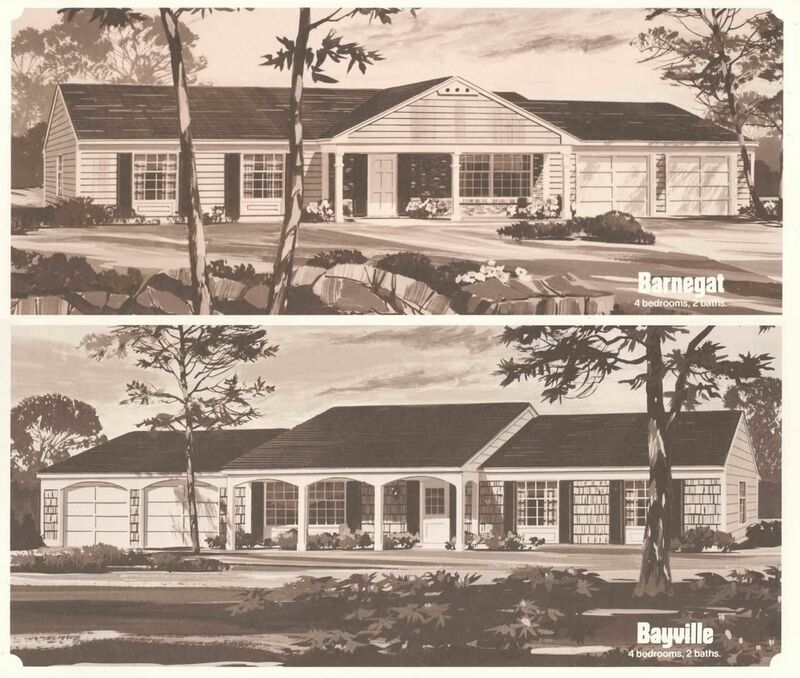 The following year, Hovnanian Bros. built its first development of 200 ranch homes in the northwest quadrant of Bay Avenue and Fischer Boulevard in Toms River--just a stone's throw from Georgetown. Hovnanian Bros. eventually split into four separate companies--K. Hovnanian (Hovnanian Enterprises), H. Hovnanian (and Menk Corp.), V. S. Hovnanian Group, and J. S. Hovnanian and Sons. Page last updated October 6, 2007.